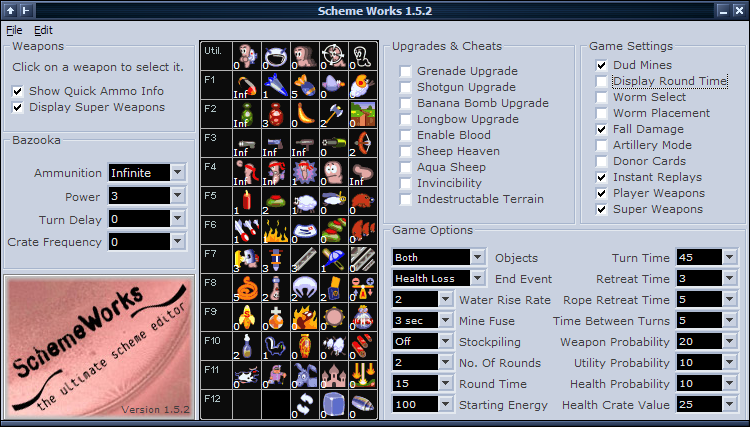 Scheme Works is a powerful scheme editor, written by Annelid. It is compatible with W:A and WWP schemes, as well as with W:A's new scheme format (which allows setting super weapon ammo), and thus can convert schemes between formats. It has a few small limitations, such as not allowing the water rise rate to be set beyond 7 or mine fuses to be set beyond random. It also lacks the Damage x2 setting. These missing settings are available in Etho's scheme editor, SchemeEddy. This page was last modified on 4 April 2011, at 14:51.